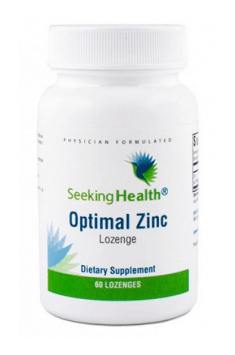 Recommended daily doses of zinc for men vary from 14 to 15 mg. Women should consume 8 mg of this element and its daily dosage during pregnancy should be increased to 10-12 mg.
To maximise zinc absorption, this supplement should not be taken with iron, calcium, magnesium and copper. This is due to the fact that all these elements compete for the same transporter. Because of that, the supplementation with one of these minerals decreases the absorption of other elements. Taking vitamin B6 with zinc allows the body to inhibit effectively the conversion of testosterone into dihydrotestosterone. This effect is achieved in physiological conditions and does not increase androgen levels above its natural range. Taking 100 mg daily is beneficial to individuals with a dietary deficiency of this element. However, this dosage should not be taken longer than 2 months.